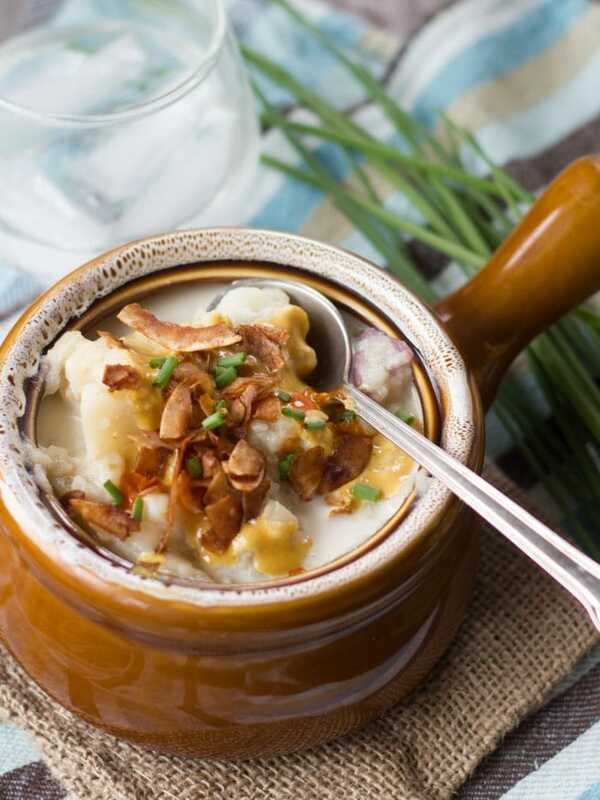 This vegan potato soup is fully loaded with flavor and toppings, in the form of fresh chives, zesty tahini cheese, and crunchy coconut bacon. How’d my fellow east coasters fare this weekend’s snowpocalypse? I have to admit, I was a bit excited about the storm in the days leading up to it. This winter was beginning to look like a bit of a rip off as far as snow is concerned, and I was happy that some was finally on the way. Then I remembered that I really wouldn’t be able to go anywhere all weekend, at least until digging my car out. I always forget what a pain that is. Then I got sick. Nothing too bad, just a cold, but between that and the storm, I took it that the universe was telling me to park it on the couch for a bit. Which is just what I did. I got up from the couch just long enough to whip up a batch of this soup, which I promptly brought right back to the couch. (Couch potato soup anyone?) It was totally worth getting up for. I’ll say this, either my cold didn’t affect my appetite at all, or this stuff was really good. (Probably both. If my appetite goes, things are really bad.) 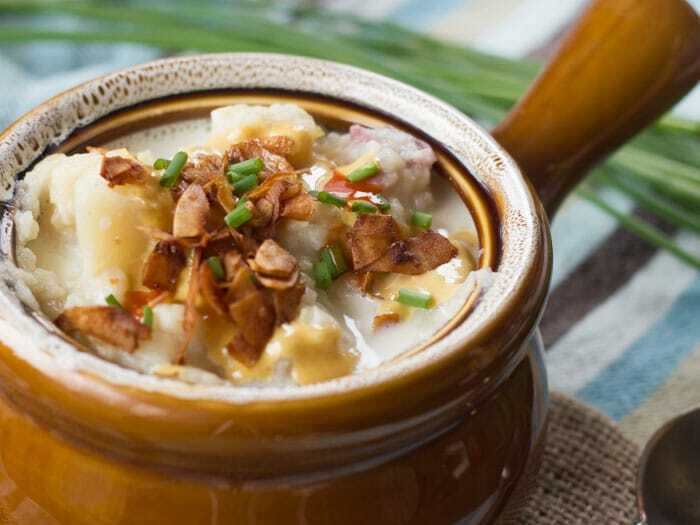 The soup itself is good, but it’s really just a basic vegan potato soup. What really makes this recipe special is the toppings. I’ve done these toppings before, but for whatever reason it never occurred to me to throw them onto some loaded potato soup. I’m so glad it did though. I never thought I’d be spending a weekend on the sofa with a bowl of cheesy bacon topped potato soup, but it was awesome. Place potatoes in a large pot and cover with water. Place over high heat and bring to a boil. Cook, uncovered,until potatoes are fork tender, about 15 minutes. Drain into a colander and set aside. Return pot to stove and coat the bottom with oil. Place over medium heat. When oil is hot, add onion and cook until softened, about 5 minutes. Add garlic and cook 1 minute more. Add 4 cups of milk and potatoes to pot. Mash potatoes lightly with a potato masher, keeping them as chunky as you like. Raise heat and bring the mixture to a simmer. Stir a few times, and add additional milk to reach the consistency you like. Cook, stirring occasionally, just until heated throughout. Season with salt and pepper to taste. Whisk all ingredients together in a small bowls. Thin with as much water as needed to achieve desired consistency. Taste test and adjust seasonings to your liking. Ladle into bowls and top with toppings. Serve. This soup thickens up quite a bit as it sits. 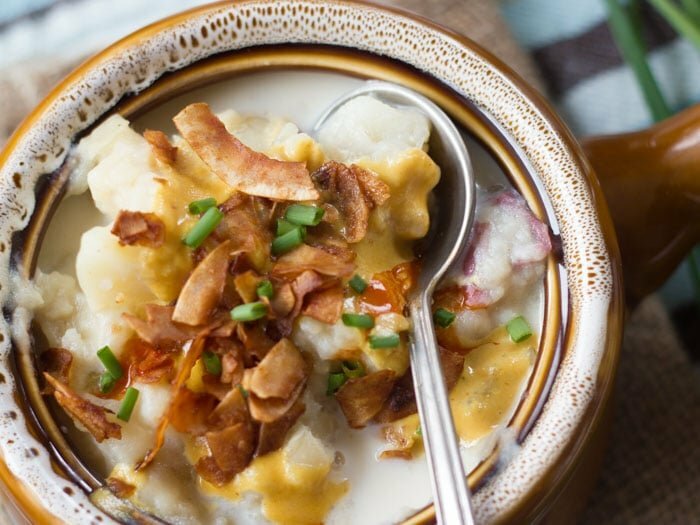 If you have leftovers, they'll probably look more like mashed potatoes than soup. Add a bit of milk or vegetable broth to re-soupify them. Nutrition information does not include coconut bacon. You can find the nutritional information for that here. Yum! I love thick, hearty soups like this. Sorry to hear you get sick! T_T The snow is kind-of nice to get after such a mild winter, and this is the perfect soup to have for a super winter wonderland. 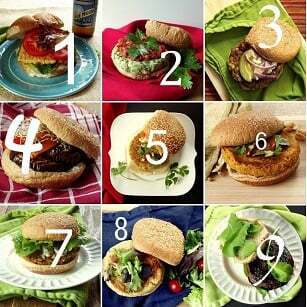 I am new to eating vegan. What is coconut bacon? My daughter and I made this today! I swear you can’t tell the difference between the vegan version and the non-vegan version. It was simply delicious! Thank you for sharing. Yay! Glad you liked it. Thanks Christine! Great recipe! I added some rosemary and thyme because I like my potato soups a little herby. I really enjoyed the tahini cheese sauce. I’ve never tried vegan cheese with a tahini base and it is a great discovery! I am going to try it in other recipes too – I think it would also be great as part of a broccoli cheddar soup. Yum! That sounds delicious and I’m so glad you enjoyed it! Thanks so much Megan! Do you add the cheese mixture to the whole pot or just the servings?